Stuart Masson is owner and editor of The Car Expert, the UK’s leading site for impartial car buying advice as well as news and information from all over the automotive world. We all know the pressure of rising fuel costs on our weekly budget. But other than buying a new, more efficient car, what can you do about it? 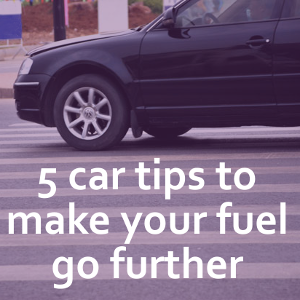 Stuart Masson, editor of The Car Expert, brings you five simple tips that well help you go further from each tank of fuel. While you’re probably very aware of how much money you spend on fuel for your car, how much effort do you put into making sure you are getting the most out of that fuel? If you’re like most drivers, probably not a lot. Did you know that there are five easy things you can do every day to make sure that you go further on every tank of fuel? And the best part is that they’re (nearly) all free! Most of us jump into the car each morning and start heading down the road without really thinking too much about exactly where we are going. But what about the roadworks going on just down the street? And it’s school run time, so there’s lots of traffic stopping around the local primary school. Maybe you should have taken a different route? Planning your journey before setting off means you don’t get stuck unnecessarily. And if you have three errands to run, do them all at once rather than making three separate trips. Simples! Quick question: What is the recommended tyre pressure on your car? I can guarantee you that 9 out of 10 people won’t know the answer. But it’s very important. If your tyre pressure is too low, then you create more friction and use more fuel. You’ll also wear out your tyres more quickly, and it will adversely affect your braking and cornering performance. A tyre pressure gauge costs a couple of quid at most and it’s absolutely worth it. Making sure that your tyre pressures are up to the correct levels won’t just save you money on fuel, it’ll save you money on tyres (and may even save your life in an emergency). Every time you put your foot on the accelerator, you use fuel. And the harder you put that foot down, the more fuel you will use. By driving carefully and thoughtfully, you can minimise how often and how hard you need to accelerate the car, and therefore save on fuel. The most simple rule to follow is to never be accelerating towards a yellow or red traffic light. Lift off and coast to the lights, rather than keeping your foot on the accelerator and then having to use more brake effort to stop. If your car has cruise control, it can save you even more money on open stretches of road by maintaining a steady speed better than a human driver can. Manufacturers spend many, many millions of pounds working to make their cars as efficient as possible at slicing through the air. The smoother the shape, the less drag the car creates and the less fuel you will use. If your car is sporting a roof rack or bike rack that you rarely use, or an England flag or similar, then you’re adding drag (and weight – see above) and using extra fuel. If you have your windows down, or even if your car is covered in dirt and mud, again you’re adding drag and using more fuel. Sounds pretty basic and all fairly obvious, right? But as a certain supermarket says, every little helps. If you treat these five simple tips as golden rules in your driving, then I promise that you’ll start to save yourself a lot of money on fuel over time.